Kevin enjoys practising law and loves the challenges of civil litigation. He has broad experience in all aspects of insurance claims litigation, including personal injury, products liability, property losses, professional negligence, class proceedings, and coverage disputes. He is an expert in handling first-party accident benefits claims and disputes between insurers (loss transfer and priority disputes). 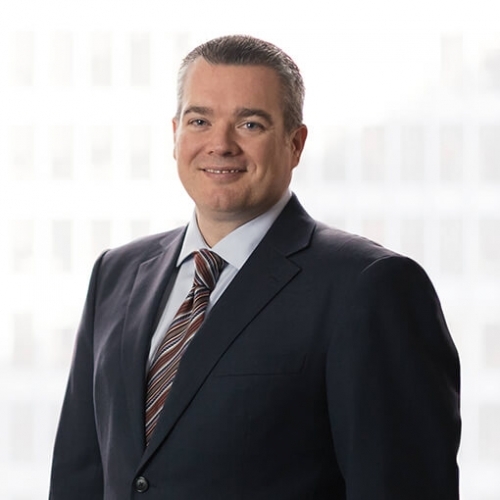 Kevin is proud to assist many of the firm’s longstanding clients with tailored, practical solutions to litigation issues, often using creative problem-solving initiatives. However, when a reasonable negotiated resolution cannot be reached, Kevin will vigorously represent his clients’ interests through trial. He appears regularly before all levels of courts and administrative tribunals, including the Ontario Superior Court of Justice and the Court of Appeal for Ontario. He has acted as lead counsel on numerous appeals, trials, motions, private arbitrations, and administrative tribunal hearings. Kevin enjoys writing and has authored many articles on such topics as insurance coverage issues, cross-border and jurisdictional issues, loss transfer disputes, priority disputes, and statutory accident benefits. Kevin is a member of the Ontario Bar Association, the Advocates Society, the Toronto Lawyers Association, Canadian Defence Lawyers, and DRI. Feel free to get in touch with Kevin at 416.594.4520 or kevin.adams@rogerspartners.com.